See drop down boxes (shown top right) to select your preferences for this solid wood sofa console table. The Amish Open Console Table with Drawer and Shelf has a beveled edge and two drawers. The long angular legs support a shelf close to the floor and let the beauty of your wall or sofa through. The shelf is barely recessed from its supports, arches low on the table ends. This custom sofa table with drawers complements a contemporary home but is elegant and sturdy enough to last generations. The Artesa Open Sofa Table with Shelf has long fanned legs and a long beveled table top. The open shelving lets light through and shows off your sofa. The shelf has a thumbnail recess from its side supports; beneath are arches on the ends. The Artesa beautifies a contemporary room. Pictured in cherry with Michael's Cherry stain. Please contact us if you would like to purchase a table individually. Choose your finish, upholstery, and other features of your piece with our drop down boxes (shown top right). Pictured in quarter sawn white oak with sand stain. Pictured in Brown Maple with Medium Walnut finish. Pictured with Onyx stain on base and Acorn stain on top. Pictured in brown maple with Onyx stain. The Boulder Creek Sofa Table will do wonders for your room with it's contemporary yet rimless qualities. Note it's gently curved legs, ebony inlay, and arched shelf skirts. The drawer features full extension slides, and the top is one inch thick to ensure durability. Use our drop down boxes at the top right of the page to select options for your Amish sofa table. This Boulder Creek Enclosed Sofa Table has a beveled top. Legs curve out from the sides and then straight down. This table has one wide drawer; two recessed panel doors reveal a single compartment with a shelf. At the bottom, the skirts are arched and the front skirt has ebony inlaying, completing the table's handcrafted look. The Carlisle Enclosed Sofa Table is a charming rendition of our Carlisle Open Sofa Table that offers the added features of full enclosure, two doors, and one drawer for extra practical storage space. This table would be great in any living room, but could also be put well to use in a dining room area to serve as a sort of mini buffet. Either location is rests, you will have a wonderful piece of heirloom furniture to cherish for years. Can be made in four different and popular wood types, and finished with our standard colors, or matched to your desired color. Let the Carlisle Open Sofa Table join your family. You won't be disappointed with any aspect of this heirloom beauty. This sofa table has a simple and elegant design with plenty of subtle details to appreciate for the many years you will have it. There is an enclosed version of this sofa table that features two doors and a drawer for added storage in your living room, or even dining room area. 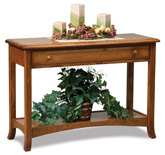 Several popular hardwoods are available for the construction of the Carlisle Open Sofa Table. Pictured in brown maple with OCS-226 Coffee stain. This Centennial Enclosed Sofa Table is solid with Mission style lines. Style features include exposed mortise joints, panel doors, and a minimalist square profile. This handcrafted sofa table boasts heirloom style. Use our drop down boxes at the top right of the page to select options for your Amish TV center. The Centennial Open Sofa Table with Drawer is tall and straight with Mission edges. Details like exposed mortise joints, diamond drawer pulls and a low, slightly recessed shelf show the quality of this handcrafted table.